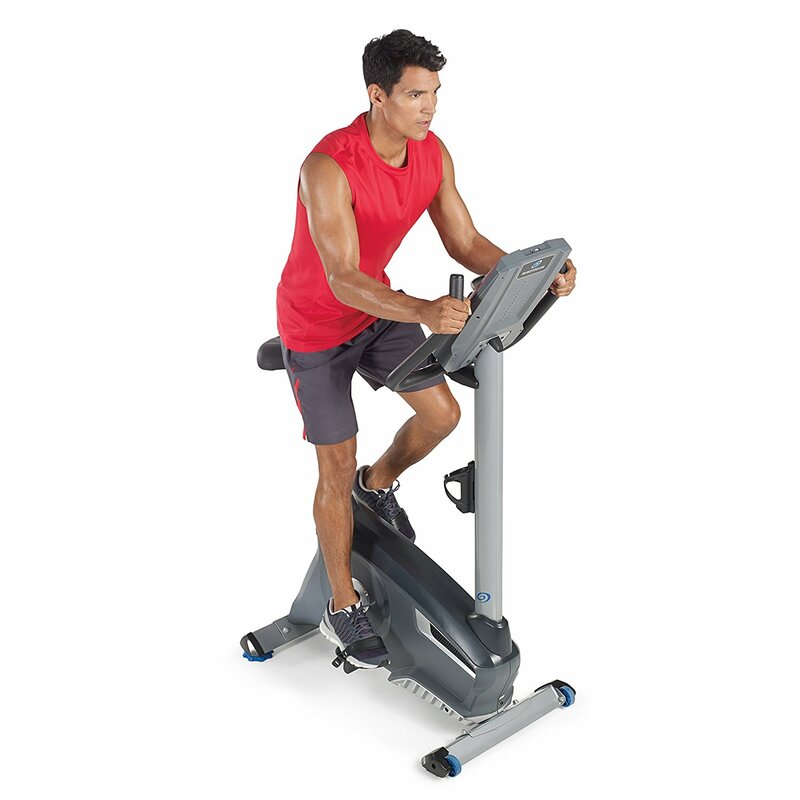 The Nautilus U614 is the newest member of the company's upright exercise bike lineup, a very affordable model that's just packed with features for the price. If you're in the market for an inexpensive exercise bike for your home, the U614 might just be the perfect solution. The Nautilus U614 Upright is compact and well-balanced, with a nice large dual-track LCD display showing you all of the important workout feedback - time, distance, calories, METs and more. The Nautilus Exercise Bikes have become quite popular over the last few years, as the company is able to pack in a ton of features and capabilities while keeping the whole line very affordable. There's something for every fitness level and the bikes are designed to be very user friendly. The Nautilus U614 comes with 22 resistance levels, so you can really build up your leg strength over time. It has a very capable 18 lb. flywheel with smooth, natural motion. It's very similar to the Schwinn 130, also made by the same company. There are 22 workout programs to choose from, about 7 fewer than what's included on the mid-level U616 and top of the line U618 upright but still plenty of variety. There are 8 heart rate specific programs, 2 fitness tests, 9 profile, 1 quick start and 2 custom workouts...so you can really challlenge yourself from one workout to the next. The U614 has grip heart rate monitoring. It's not as accurate as the wireless heart rate capability that the U616 and U618 have, but it should suffice for most users. Other than the nice array of resistance levels and workout programs, you get 2 user profiles, a comfortable padded seat, water bottle holder, tablet shelf, music capability with a speaker system and transport wheels. The U614 has a maximum weight of 300 lbs., so it should accommodate most users. The one negative that we discovered during our review is the warranty. You get 10 years on the frame and 90 days on labor, which isn't the greatest coverage we've come across. Still, for this low a price you can't expect the most high-grade durable exercise bike on the market. As such opt for the additional coverage if it is available for peace of mind. How Does the U614 Compare to the Rest of the Nautilus Exercise Bikes? The Nautilus U614 is the entry level model in the series, so even though it does have a lot of features and extras, it is lacking some of the capability of the upper level bikes in the series. The base model, as you've read about above, gives you 20 levels of resistance, an 18 lb. flywheel, 22 workout programs, 2 user profiles, grip heart rate and a 300 lb max user weight capacity. The mid-range U616 bike ups the ante in most categories, with 25 levels of resistance, a 22 lb. flywheel, 29 workout programs, 4 user profiles, as well as grip and wireless heart rate. It also adds Bluetooth workout tracking via the Nautilus Trainer and Ride Social apps, larger seat and deluxe pedals. The top of the line U618 is very similar to the U616, but has an even heavier 30 lb. flywheel, free wireless chest strap, the most advanced display, an oversized Nautilus Gel seat, premium pedals and enhanced handle bars. It is 20 pounds heavier than the U616, with a 325 lb.max weight capacity and a stronger warranty overall. So when you compare the Nautilus U614 to the U616 and U618, you can see that you just get more as you move up in the lineup. You get more workouts, resistance levels and tracking ability, as well as more premium touches and stronger warranties. There's only about a $200 price difference between the models, so it's worth considering one of the more advanced Nautilus bikes if you can swing it. Is the Nautilus U614 upright bike worth buying? We think so. Where else can you find this many features for under $300? You get a huge number of built in workouts, plenty of resistance levels, a capable, intuitive display and comforts such as music with speakers, a tablet holder, water bottle holder and workout fan with 3 speeds. That's a lot of stuff for such an inexpensive compact exercise bike. Still, if you have the money for it, take a look at the U616 and U618 as well. They give you even more to work with, and the Bluetooth workout tracking is a great feature to have. You can keep tabs on your progress and share your results with family and friends, something that a lot of users find very motivating.